Two vectors A and B are parallel if and only if they are scalar multiples of one another. A = k B , k is a constant not equal to zero. Two vectors A and B are perpendicular if and only if their scalar product is equal to zero. Which of the following vectors are parallel? A = (2 , -3) , B = (-6 , 9) , C = (-1 , -2)? The condition for two vectors A = (Ax , Ay) and B = (Bx , By) to be parallel is: Ax By = Bx Ay. Let us test vectors A and B first. Vectors A and B are parallel. Vectors A and C are not parallel. Find the real number k so that the points A(-2 , k), B(2 , 3) and C(2k , -4) are the vertices of a right triangle with right angle at B.
ABC is a right triangle at B if and only if vectors BA and BC are perpendicular. And two vectors are perpendicular if and only if their scalar product is equal to zero. Let us first find the components of vectors BA and BC given the coordinates of the three points. Find the equation of the circle with diameter the points A(2 , -2) and B(4 , -3). For a point M(x , y) to be on the circle defined by its diameter, triangle AMC must be a right triangle with the right angle at M. Triangle AMC is right at point M if and only if the scalar product MA· MB is equal to zero. Let us first find the components of vectors MA and MB given the coordinates of the three points. Given vector U = (2 , -5), find. a) the equation of the line through point A(1 , 1) and parallel to vector U.
b) the equation of the line through point B(-2 , -3) and perpendicular to vector U.
a) A point M(x , y) is on the line through point A(1 , 1) and parallel to vector U = (2 , -5) if and only if the vectors AM and U are parallel. Let us first find the components of vectors AM. b) A point M(x , y) is on the line through point B(-2 , -3) and perpendicular to vector U = (2 , -5) if and only if the vectors BM and U are perpendicular. Let us first find the components of vectors BM. Find the equation of the tangents through the point D(2 , 4) to the circle of center C(0 , 0) and radius 2. 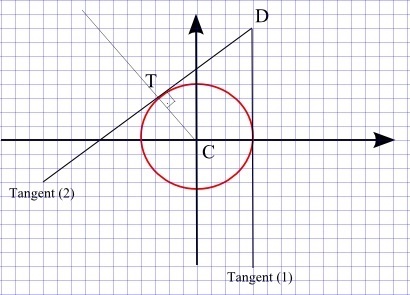 From point D outside the circle, two tangent through D to the the circle of center C may be found(see figure 1 below). Fig1. - Tangent through a point to a circle. 2) The magnitude (or length) of vector TC is equal to the radius. We next use condition 2) above using the square of the magnitude.